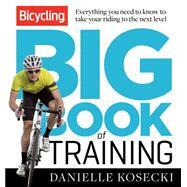 Bicycling Big Book of Training is an encouraging, focused training book that will speak to beginner and intermediate cyclists without making them feel like novices. It covers all the information the reader needs to begin an effective training regimen. The book is divided into five sections that are then broken into miniguides for various cycling training disciplines. Cyclists will learn about how the body becomes fit and how that fitness translates to on-the-bike performance, while discovering the components of a successful training plan, including nutrition. Furthermore, riding disciplines such as road racing, endurance events, cyclocross, mountain biking, and track are discussed at length so readers can figure out which activities are right for them. Bicycling Big Book of Training is an excellent guide for anyone who wants to learn more about cycling and take their performance to the next level. Danielle Kosecki is the health editor for Glamour magazine. Past writing gigs include Fitbie.com, More, Prevention, Atlanta Sports & Fitness, and Caribbean Travel & Life magazine. Kosecki is a category 2 roadbike racer for CityMD Women’s Racing Team, with hopes of eventually tackling the track, trails, and velodrome. A lifelong athlete, she discovered bike racing while dabbling in triathlon after her collegiate soccer career. She lives in Brooklyn, NY.